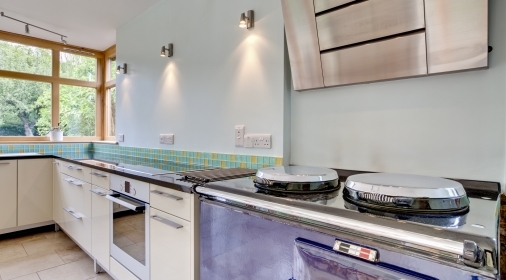 Cleaning a greasy oven is a very strenuous task that many people put-off, however delaying this chore means that the oven grease will continue to build up, resulting in your appliance becoming very unhygienic. We’ve provided a couple of quick fixes for removing oven grease from a greasy oven. However, it’s worth bearing in mind that these methods won’t completely eliminate grease, unfortunately, they will only be able to lift surface grime. 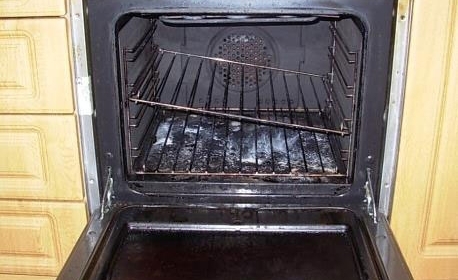 For excellent results, you may want to consider a professional oven clean. Once you’ve emptied the oven and removed the racks, mix half a cup of baking soda with a few tablespoons of water until you have a spreadable paste. You can always add a little more water if it’s not the right consistency. Then put on some gloves and coat the oven all over the interior surfaces of your oven, avoiding the heating elements. To really help lift oven grease, apply a slightly thicker layer to the parts where grease has collected. Then let it sit for around 12 hours. After this time, take a damp dishcloth and wipe out as much of the paste as you can. Put a little vinegar in a spray bottle and spritz everywhere you still see baking soda residue in your oven. Do a final wipe down to help remove the oven grease and repeat until all the residue is gone. Take a look at our advice on Mr Muscle oven cleaner to remove grease from the oven – a popular choice for DIY cleaning the oven. Once you have removed the oven racks, fans and applied the solution according to label instructions, ensure that the oven cleaning solution is left on for the amount of time recommended, especially for a particularly greasy oven. If the solution isn’t left on for a significant amount of time, it will be more difficult to lift the grease from the appliance. Use a glass scraper to scrape off the baked-on food, and then wipe away the grease and oil with hot water and oven cleaning solution. 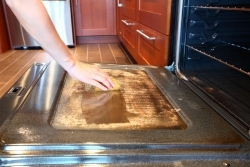 To remove excess oven grease, give your oven a final wipe down after completing this procedure. 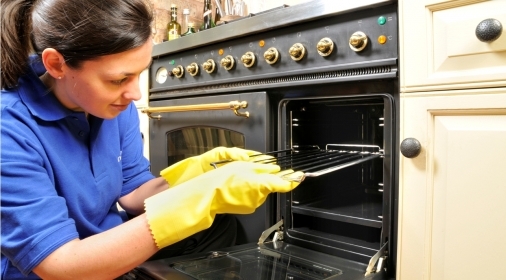 Go to our blog for more detailed and thorough instructions on How to clean an oven. Although these are generally the best DIY methods to remove grease from an oven, you won’t be able to remove very thick, stubborn oven grease from your appliance without professional deep-clean systems. Unfortunately, DIY methods are limited in their results and are only able to remove surface grime and grease. If you’re looking to transform your oven to ‘as-good-as-new’ again, completely eliminating grease and grime, then a professional oven clean is the best option for you. Why not call the UK’s original oven cleaning service with over 20 years’ experience and more than 100 local specialists across the UK? Click here to see some Ovenclean before and after photos – we use an innovative, non-added caustic system which is exclusive to Ovenclean, achieving spectacular results with no harmful fumes and no mess! If you would like to leave the hard work to us this time, call us on 0800 840 7127, or complete our online form for your free quote.